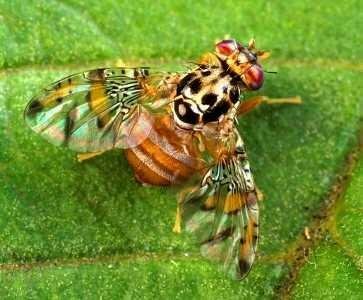 Two species of fruit flies (Bactrocera dorsalis and Ceratitis capitata) attack Cocoa in Kenya. One of the most effective control techniques against fruit flies in general is to wrap fruit, either in newspaper, a paper bag, or in the case of long/thin fruits, a polythene sleeve. This is a simple physical barrier to oviposition but it has to be applied well before the fruit is attacked. Apply baits (see more under Fruit fly site).